This is a very simple fall wreath I made in about 30 minutes. 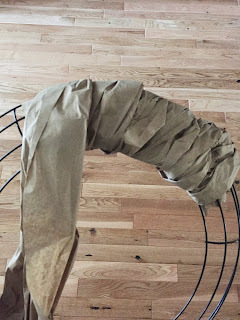 I had see someone post a wreath the other day using a foam wreath and covering it in the brown paper packing stuff you in packages for protection. I had a package from Amazon the other day that a good amount of this stuff in it. 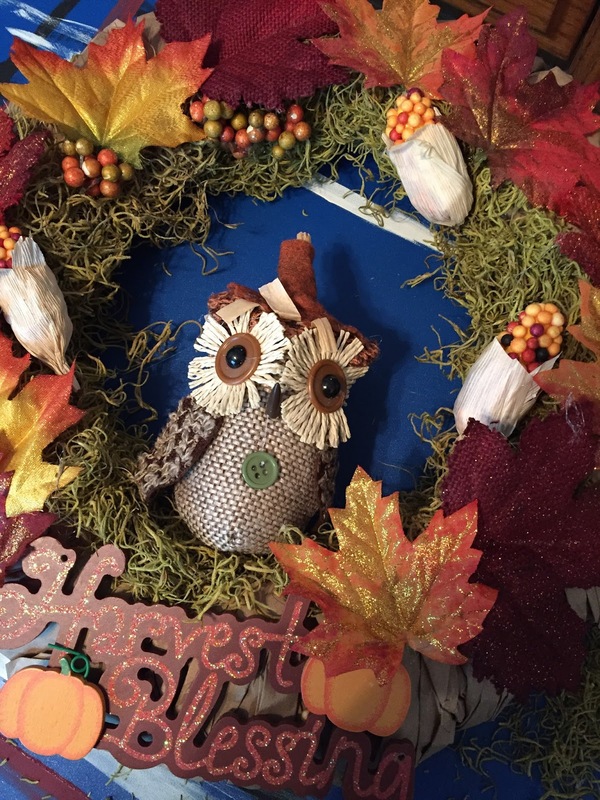 I was in the decluttering mood this morning and was about to throw it away when I remembered that wreath idea. I had all the items on hand. Instead of a foam wreath I used a wire wreath ($1 from Dollar Tree) and wrapped the paper around it. 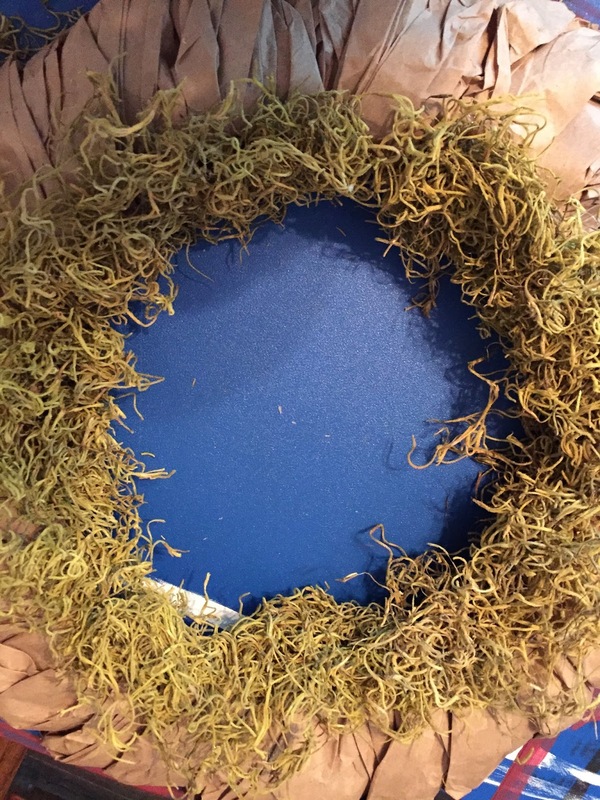 I used the hot glue gun and glued some moss around the inside. I had some fall floral decor pices that I snipped apart. Glued these wround the edge. 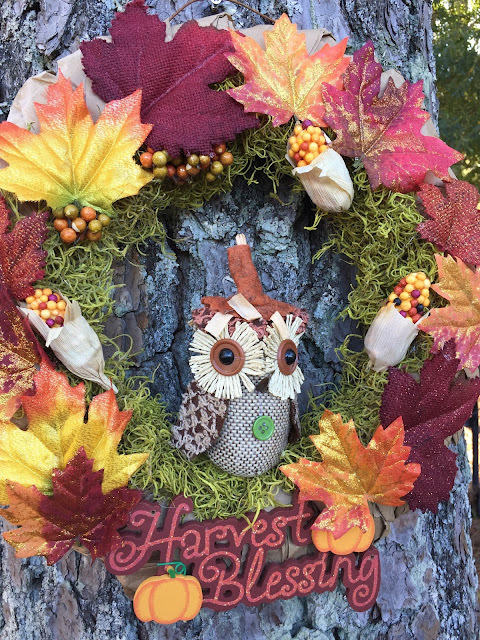 A little sweet owl and a fall sign from the Dollar Tree. I wanted to make it my own so I did some things differently. Here is a list of items that I used. 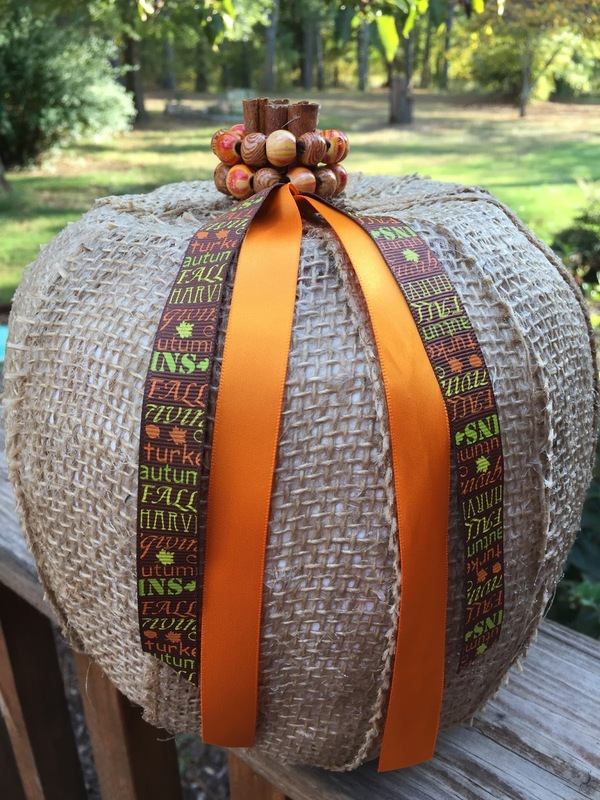 I started with the pumpkin and covered it with duck tape. You can just cover the top opening and then paint it or if you don't mind the orange you can just leave it. I am an impatient crafter so duck tape was the fastest way for me. Once you have it covered you start applying the strips of burlap. You want to overlap the strips a little. 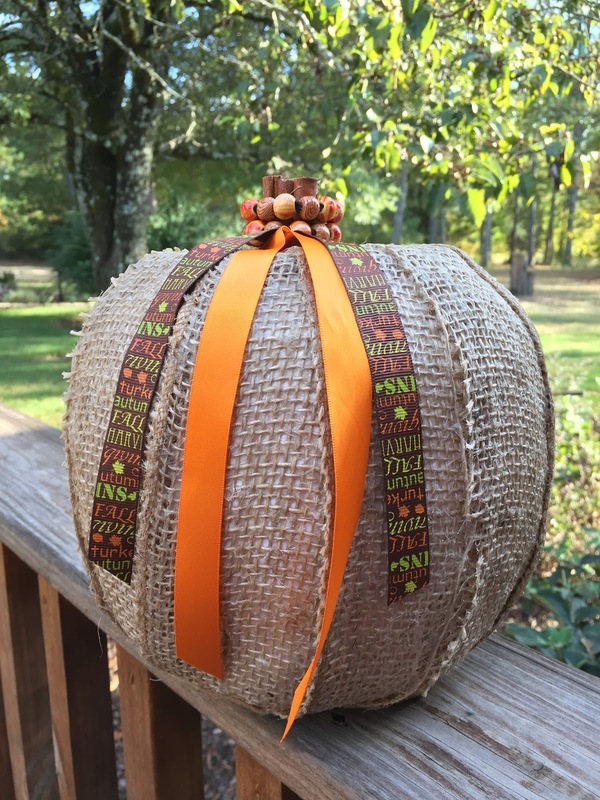 I put mod podge on the pumpkin and applied more over the top of the strips. You want to overlap them on the top and meet in the center. On the bottom you just want them to lay in a single layer. 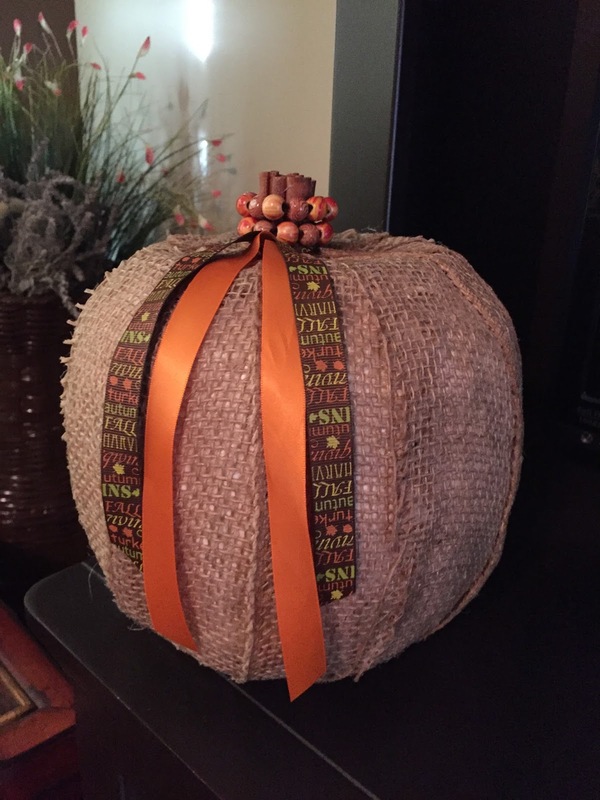 Reason being is that you will glue a piece of felt on the bottom and you want the pumpkin to sit flat. 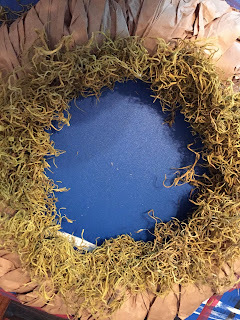 I cut a circle piece of felt and with the mod podge still wet I applied it to the bottom. 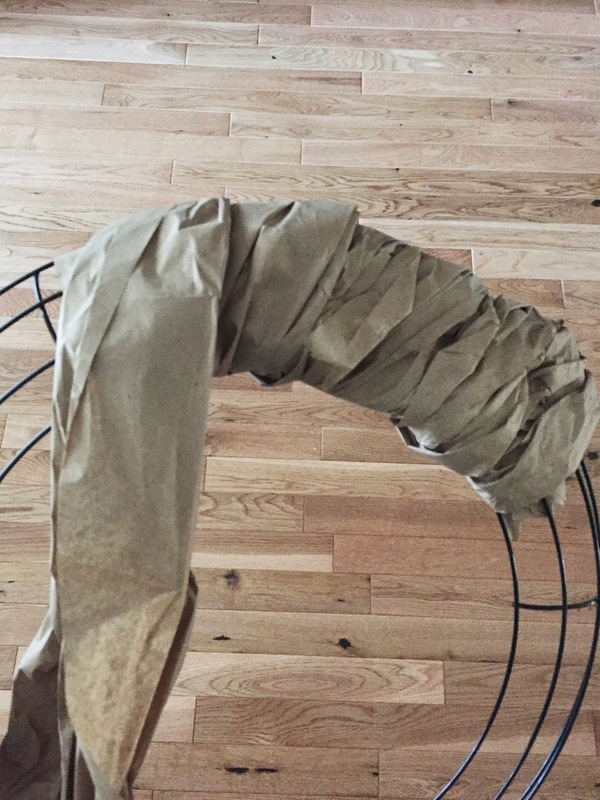 Let the burlap dry completely. Once dry I decided to use some cinnamon sticks glued together for the stem. I made a hole in the top large enough for them to tightly fit. I added ribbon and took a pipe cleaner (cut in half) and strung beads on it. I wrapped two of these around the stem to add some bling. This is a pumpkin topiary made from those $1 plastic pumpkins from Walmart. 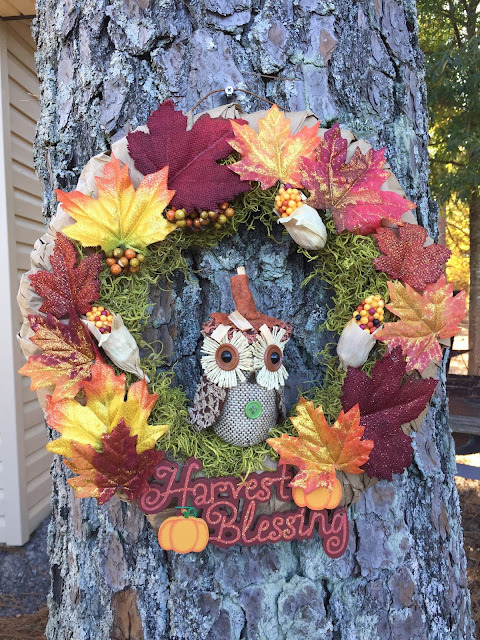 Another simple fall project. 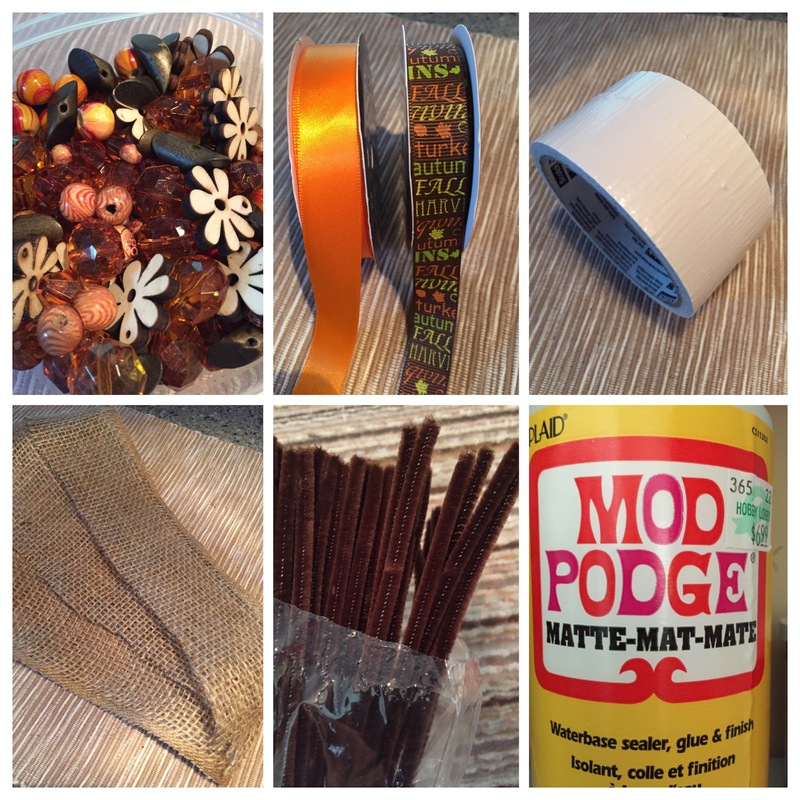 You will need these items to complete. This is the pumpkins you will use. I know they have a face on them but the face will be towards the back. Once you paint them you can still see the face outline but it is not quite as pronounced. I used a Metallic color for the one I did. You can use what ever color you want. 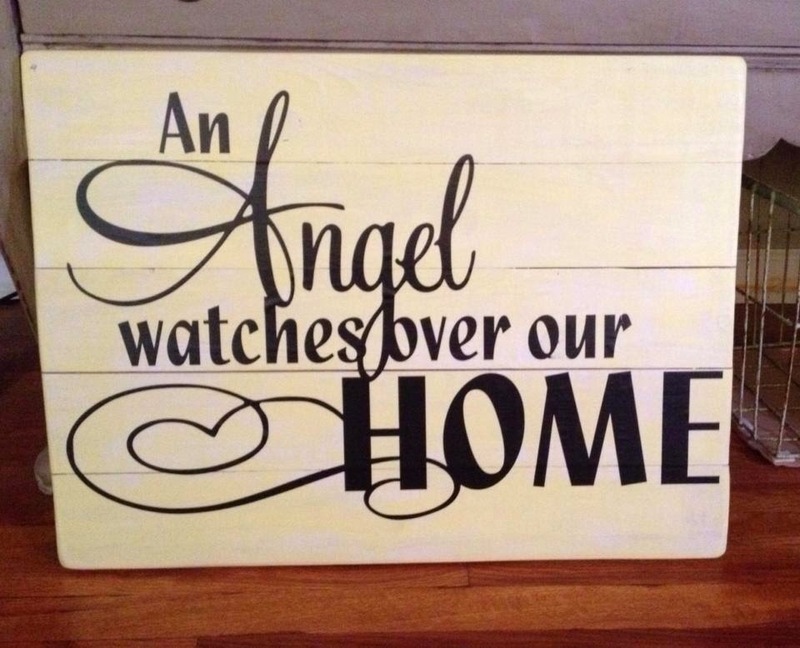 I have seen versions of these done in black, white or a cream color. Once painted and dry you can put on the letters. I used my Cricut to cut the letters from vinyl. You could cut a template and paint them on. If you are really talented (I am not) you could free hand it. You can change the words to what ever you want. I know my sister up North said she wouldn't put the Y'all but I am in the south so it works well. The next step is to add the top flower arrangement. I cut some small pieces of styrofoam and layered them inside the top pumpkin. I then just stuck the arrangement in and added some moss around the edges. to finish up you will want to add some rocks or something heavy to the bottom pumpkin to keep iot stable. You can glue the pumpkins together if you want. I did not beings mine will stay inside. I would think if you wanted it outside you might need to come up with a way to stack it on a large base to keep it from tipping in the wind. 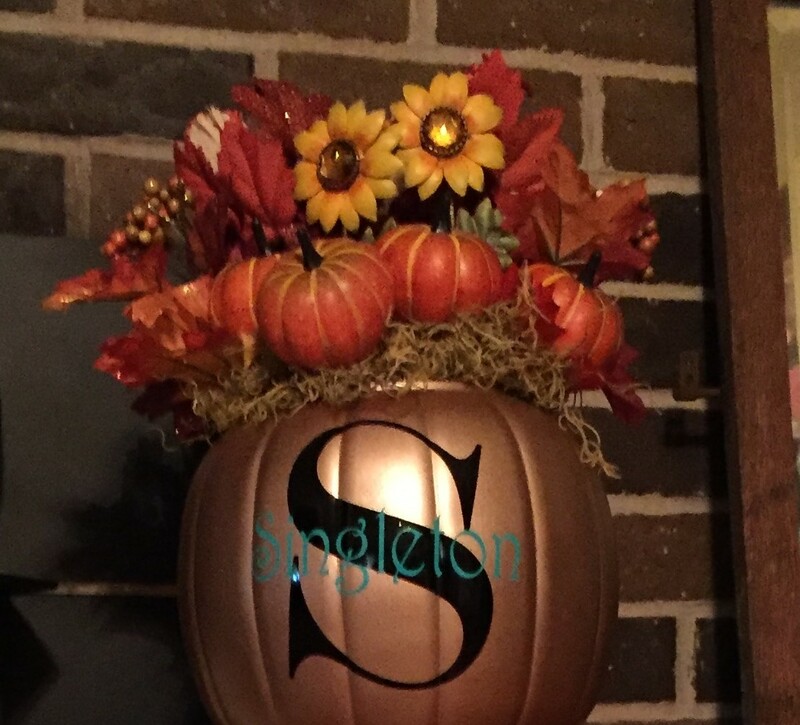 You could use a large flower pot or urn and fill it with rocks and have something over the top to glue the bottom pumpkin too. I may try one for my outdoor fall decor. Another idea that I have seen is to put your house numbers on instead of words. Just love how it turned out.